The good news is that Donald Trump is not imitating all of Herbert Hoover’s statist policies. The bad news, as I explain in this interview, is that his protectionist mistakes could trigger a repeat of Hoover’s beggar-thy-neighbor protectionism that wreaked havoc in the global economy during the 1930s. Well, this is why I’m so agitated about what Trump is doing. It’s true that the economy will not be wiped out by the trade taxes he’s imposing today. But what happens when other nations retaliate, and then Trump doubles down with additional taxes on global commerce? That’s a potential recipe for a big reduction in worldwide liberty. Which is exactly what happened in the 1930s, as illustrated by this chart from an academic study. At the risk of understatement, that would not be good for American prosperity. And blue-collar workers would be among the victims since protectionism always destroys more jobs than it saves. The Washington Post reports on some bipartisan legislation that would curtail Trump’s authority to unilaterally destabilize world trade. Sen. Bob Corker (R-Tenn.) introduced a bipartisan bill Wednesday that would give Congress new authority to check the president’s trade moves… Corker’s bill would require congressional approval when the president enacts tariffs under the auspices of national security, as Trump did last week in imposing levies on aluminum and steel imports from Canada, Mexico and the European Union. The legislation, which Corker released with a total of nine Democratic and Republican co-sponsors, is the most forceful congressional response to date to Trump’s protectionist trade agenda. …The bill’s prospects are unclear. Corker acknowledged that some Republicans are unwilling to cross the president, and Majority Leader Mitch McConnell (R-Ky.) has ruled out bringing up the measure as a stand-alone bill. But Corker’s bill appeared to be gaining traction on and off Capitol Hill on Wednesday. The U.S. Chamber of Commerce announced its support, as did Koch Industries. …Corker’s legislation would require the president to submit to Congress any proposal to adjust imports in the interest of national security. The legislation would qualify for expedited consideration for a 60-day period. …The co-sponsors are Republican Sens. Patrick J. Toomey (Pa.), Lamar Alexander (Tenn.), Mike Lee (Utah), Ron Johnson (Wis.) and Jeff Flake (Ariz.), along with Democrats Heidi Heitkamp (N.D.), Mark R. Warner (Va.), Brian Schatz (Hawaii) and Chris Van Hollen (Md.). I’m sympathetic to such legislation, not only to thwart Trump’s protectionism, but also because I don’t think any White House should have so much unilateral power. In other words, I’m philosophically consistent. I didn’t think it was right for Obama to have the authority to arbitrarily change provisions of Obamacare and I don’t think it is right for Trump to have the authority to arbitrarily change provisions of trade law. But let’s stick to the trade issue. Lower taxes on global commerce are one of the great achievements of post-World War II era. Policy makers around the world have lowered barriers and allowed the free market more breathing room. That’s been a very successful policy. By the way, politicians from developing nations deserve special credit. They’ve been especially aggressive in lifting the burden of trade taxes. Here’s a chart prepared by the Confederation of British Industry. I started today’s column by warning that Trump shouldn’t emulate Hoover. I’ll end the column by pointing out that Reagan is a better role model. And if that doesn’t work, maybe we can educate the President on why it’s good to have a capital surplus, which is the flip side of having a trade deficit. I’m quite ambivalent about the tariffs. On principle, of course, I am against free market distorting tariffs. 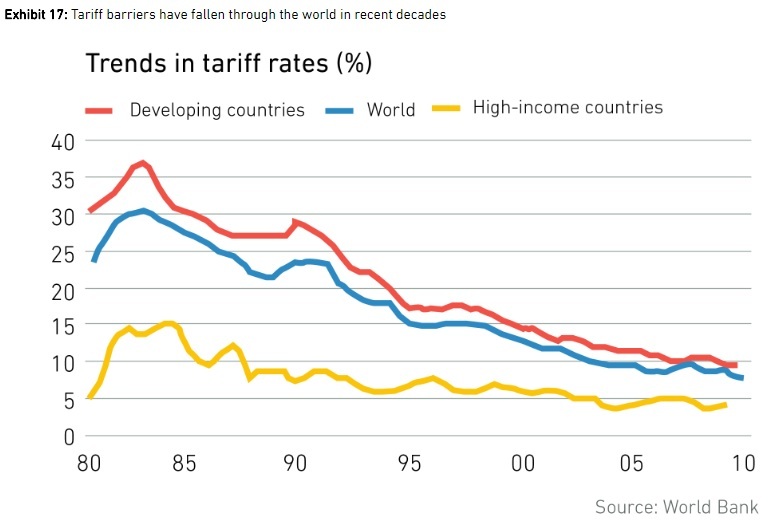 I’m also half amused by smug intellectual European politicians (who supposedly understand trade much better than our own simpleton president) applying revengeful counter-tariffs, as if that were something that moderates the damage. It is like an intellectual writer, who supposedly knows much better, who stops buying fish from the fisherman because the simpleton refuses to buy his sophisticated books. You may get some satisfaction, as idiotic duelers may have once said, but you are essentially adding damage to damage. There’s something weird when you do that as a smug intellectual who supposedly knows better. But let’s return to why I’m ambivalent about the Trump tariffs…. I’m ambivalent about the tariffs because, from a tactical point of view I am more afraid of world harmonization into an ecumenical global government, global laws, and global culture. Global trade tensions, as well as the other tensions they will precipitate, will significantly help us move away or at least stall the process of transition towards global governance by OECD, IMF, climate change and environmental commissars, G7s, G8s, G20s, unified laws and universal culture — all twenty first century vehicles of a new kind of totalitarianism. BTW, I think that many nations sense this new oppression and that’s why there’s upheaval amongst many electorates but they grossly misinterpret the causes and most often take actions in the wrong direction, making the situation worse, by supporting even bigger statists like Marine Le Pen. In other words, I think globalization of competition is good, however global harmonization and homogenization of government, regulation, and laws, is bad — way bad. Consequently, I think that the globalization of commerce, capital and people movement, is a great thing. Because it encourages competition and a multipronged approach to human advancement. Globalization of laws, regulations and culture is bad because it imposes a one size fits all dirigiste authoritarian straightjacket — be it labeled “progressive” or not. So, in summary, I think that a few bad tariffs may not be that bad if they help prevent something worse. Having said that I’m aware of the dangers and pitfalls of placing strategy before morals (morals to me are long term utility, as I’ve opined in the past). So, to the question : “Can’t we all just get along” — and be ruled by an ecumenical French style government ? I say no — thank heavens we cannot all just get along! So, in my fantasy, I see Trump doing this as part of this greater plan against the globalization of government, laws, taxes and culture, and see Trump as a genius (ok, I said, it is just a fantasy, but I sometimes enjoy thinking it’s true). Now, most voters, deep inside, are opposed to free trade for different reasons, which is accelerating the decline and eventual demise of currently advanced democracies. PS. The US is playing down its relationship with Europe and that is a good thing. Or at least it is an inevitable thing since Europe (with a structural growth rate way below world average) is in irreversible arithmetically deterministic decline, and so Europe’s economy will keep representing an ever smaller percentage of total world economic activity. That is realpolitik on behalf of the American president. The problem is that due to accumulation of progressive policies on this side of the Atlantic, the US is facing the same fate as its old continent brethren :decline — albeit with some delay and at a slower rate. But the end result will be the same unless the country changes course — doubtful. Countries under the stress of decline typically double down on coercive collectivism as resentment imposes the forceful recruitment of individual to serve the cause of perceived communal goals.